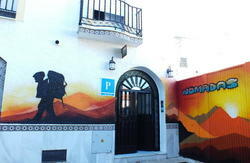 Our brand new hostel is a charming 100+ year old typical Andalusian house with a friendly, urban feel. The hostel was created as an idea by two travelers that want to make your stay in this beautiful city as comfortable and memorable as possible. Casa Al Sur is located in the magnificent historic center of Malaga. It is a great starting point to explore the area that has so much to offer! Our house is tucked in an idyllic side street within a short walking distance to all the main sites: Museo Picasso, Museo Thyssen, the famous Calle Larios, Malagueta beach, la Alcazaba, the Cathedral, as well as tons of theaters, restaurants, bars and clubs. Like all travels are different, our accommodations are different: We offer private or shared rooms with or without balcony all with a comfortable, modern look. We want you to feel at home - relax and meet fellow travelers in our lounge, enjoy the Malaga sun on the roof deck terrace and cook for your friends and family in the communal kitchen. 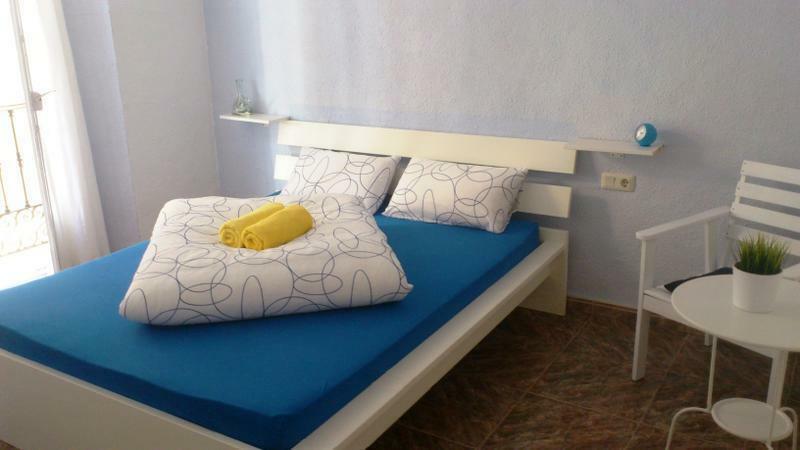 The hostel also provides free WIFI, ceiling fans in every room / heaters in the winter, laundry service and reception with information desk (we speak: Spanish, English, German and a little bit of French..). One of the owners is a Sommelier and offers wine tastings to our guests. 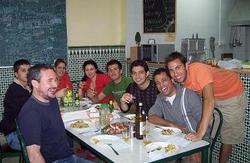 - Take the train (renfe) C1 with direction Mlaga and leave at the station 'Mlaga Centro Alameda (train ride: 12 min. / 1,70 ). - Look for the river that you follow on its right north/up (looking towards the mountains) for about 500 m. until you reach 'Calle Carretera'. - After about 300 m. you reach our little street 'Calle Molinillo del Aceite' on the left (walking time from the station: ca. 10 min.). - Take the express-bus 'A into the city and leave the bus at the stop 'Alameda Principal' (train ride: about 30 min. / 2,00 ). - Cross the street and turn into 'Calle Pastora' (to the left of the bookshop 'Librera' and 'Taco Bell'). - Go straight and turn left into Calle Sagasta. - Follow 'Pasillo de Sta Isabel' that turns into 'Calle Carretera'. - Take the N340 (Direction: Mlaga) which turns into highway MA21 (A7). - After about 1 km you leave at exit No. 7 (Avenida Andaluca / Centro Urbano). - Follow the sign: 'Centro Urbano'. - After about 2 km you choose the lane on the right to turn left in front of Shopping-House 'El Corte Ingls' (Constructions!). - Past El Corte Ingls, turn directly right into 'Calle Hilera'. - Go straight, cross the river and turn left along the river. - After 400 m. you reach our side street Calle Molinillo del Aceite on the left (no parking!). - TO THE PARKING LOT: Keep going straight. Turn the first side street left; then left again; turn right; then right again. - Parking Lot Las Delicias: 12 / 24h (Calle Don Rodrigo 3). - In the parking lot: Leave the big wood door (opposite site from where you drove in). - Go straight, after 150 m. you reach 'Casa Al Sur' on the right (No. 5). - About 20,00 (ca. 15 min. ride). - Take the bus (e.g. bus 'A') to 'Alameda Principal' (bus ride: about 5 min.). - Follow 'Pasillo de Sta Isabel', that turns in 'Calle Carretera'. - Take the train (renfe) C1 with direction Mlaga and leave at the station 'Mlaga Centro Alameda (train ride: 2 min.). - Look for the river that you follow on its right north/up (looking towards the mountains) for ca. 500 m. until you reach 'Calle Carretera'. - Leave the station through the entrance that is located under Media Markt. - Walk straight into Calle Cuarteles where you keep going for about 600 m.
- When reaching the river, follow it north/up (towards the mountains) and cross it over the bridge Puente de la Esperanza. - Turn left into 'Pasillo de Sta Isabel', that street turns into 'Calle Carretera'. - After about 300 m. you reach our little street 'Calle Molinillo del Aceite' on the left (walking time from the station: ca. 20 min.). - About 7,00 (5 min. ride).